Latitude: 41.529559N. Longitude: 8.918266E. On the Plain of Cauria (Plateau de Cauria), 15 kms to the southwest of Sartè (Sartène) on the Island of Corsica, (France), stands the most famous Corsican Megalithic structure: the Dolmen of Fontanaccia, Funtanaccia Dolmen, or ‘Stazzona del Diavolu’ (the Devil’s Forge), which dates from the late Neolithic/early Bronze Age. 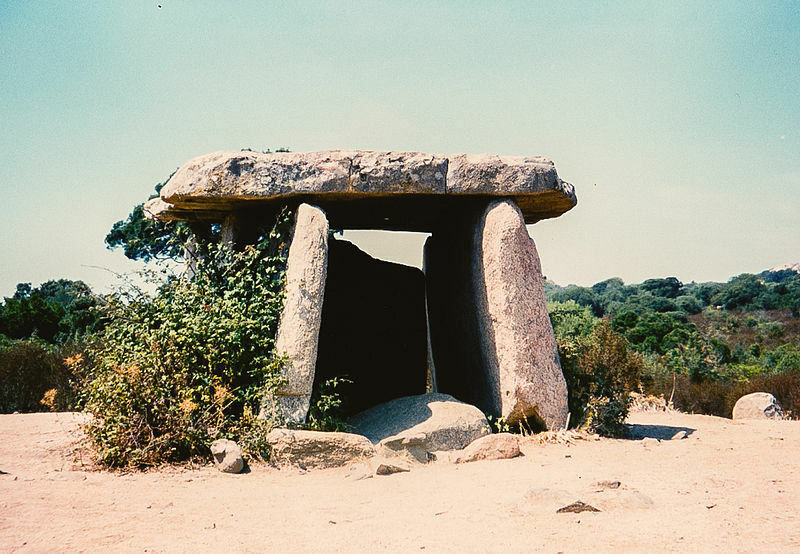 This very important prehistoric burial chamber (table tomb) is located in the Dept: Corse-du-Sud, near the end of the D48A road, southwest of Sartène, and near Tizzano on the southwestern coast. From Sartène follow the D21, D48 and D48A roads going southwest to the megalithic monument. The Dolmen of Fontanaccia with its huge, flat capstone-table and six massive stone supports, is thought to be up to 4,000 years old (the 2nd -1st millennia BC). 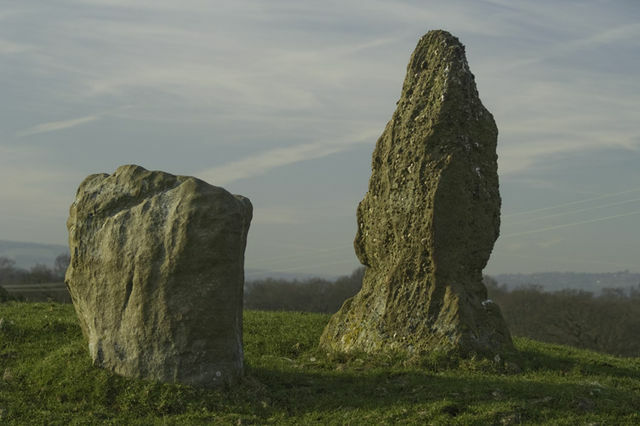 About ½ km to the northeast of the domen is ‘The Alignment de Stantari’, a group of fifteen menhir statues, while 1 km to the south of those another prehistoric site composed of forty-six standing stones known as ‘The Rinaghju Alignment’. 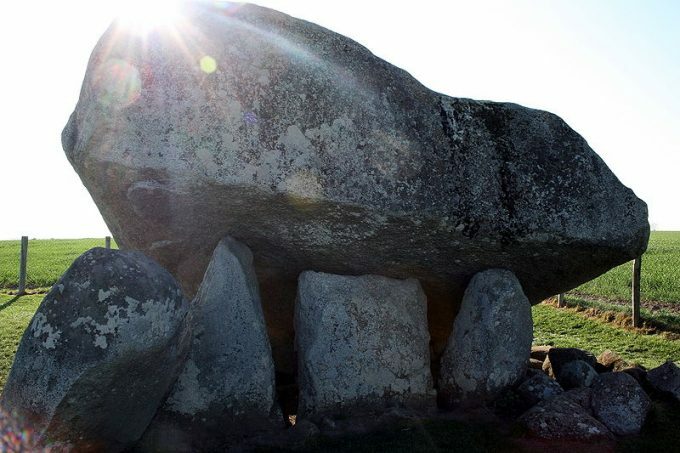 About 1 kilometer to the northeast of the dolmen, at the center of the Caurian plain, is another prehistoric site called: ‘The Alignment de Stantari’, a group of fifteen granite menhir statues. These strange carved stones were probably erected some-where between the 13th and 7th centuries BC? Stantari meaning “man on his feet” in the island’s language. The stones measure between 2.78 and 2.91 in height. And another 1 kilometer to the south of these statues is yet another prehistoric site: ‘The Rinaghju Alignment’, which is composed of forty-six granite standing stones in two parallel rows. The tallest stone being 1.50 meters high, according to Olivier Jehasse in her work of 1992. Jehasse, Olivier, Corsica – Island of beauty, (English Translation: Ilene Steingut), Edition: Plurigraf, Narni – Terni, Italy, 1992. Categories: Burial Chamber, Dolmen | Tags: Dolmen of Fontanaccia on Plain of Cauria in Corsica (France) | Permalink. OS grid reference: SH 5198 6972. Plas Newydd prehistoric burial chamber, cromlech or dolmen, stands just 300 metres north-east of the shoreline of the Menai Straits – at the south-side of the island of Angle-sey and, just opposite Plas Newydd House and Country Park – in whose “private” grounds it is situated. The site is 1½ miles south-west of Llanfair P.G. village and Menai Bridge, which links the Welsh main-land to the island. After the Menai Bridge and link-road take the A5 road, then the A4080 (Ffordd Brynsiencyn) road to the south-west for 1 mile. Take the first lane that runs off this road (south) to the NT Plas Newydd House. The ancient monument is just 150m to the south-east of the carpark and on private land in front of the big house! And ½ a mile to the south, at the edge of the country park, is a second ancient monument, Bryn-yr-Hen Bobl, which is a chambered cairn. 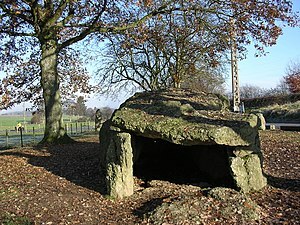 There are actually two burial chambers next to each other here, the larger one having a gigantic oblong-shaped capstone weighing many tonnes and measuring 3.5m x 3m, which is supported by five large and sturdy uprights, whereas the smaller chamber’s capstone is 2m x 1.7m and is supported by three smaller, round-shaped boulders. It would seem that the smaller monument acted as an antechamber (passage-way) to the larger monument. 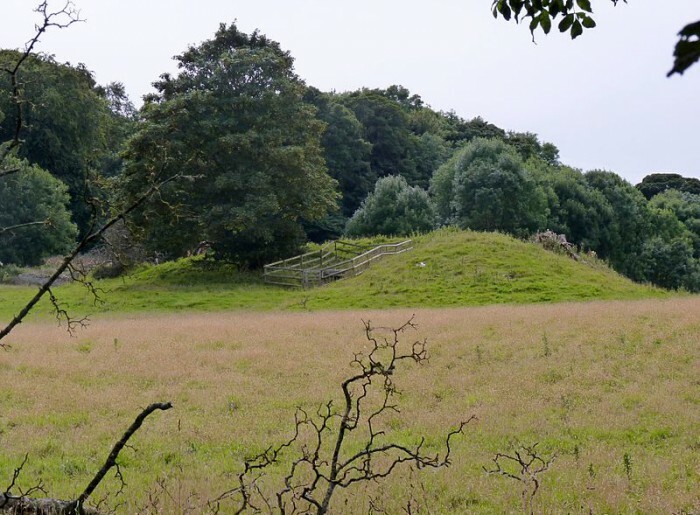 These burial chambers are said to date from the Neolithic age. Nearby there are some boulders embedded in the ground – they are probably outliers – and maybe an indication that the burial site once covered a larger area than it does now. 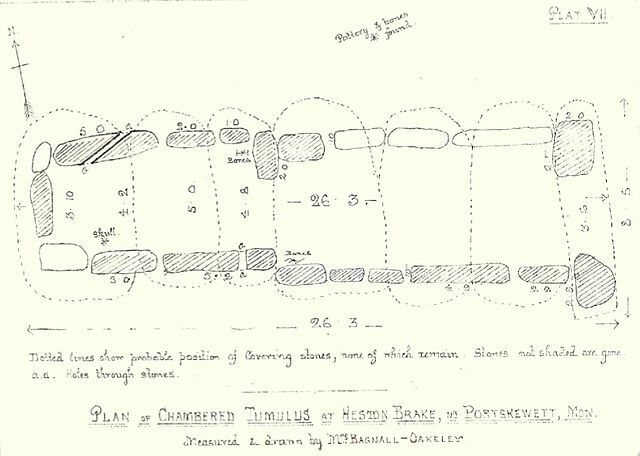 There is no sign today of the large earthen mound that would have originally covered these monuments, or did each burial chamber have its own separate covering mound? 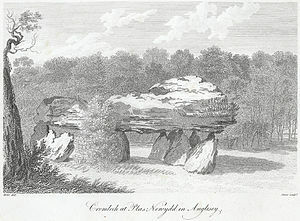 Plas Newydd burial chamber were first marked as a cromlech on the OS map of 1841 and as Burial Chamber on the 1947 map, and later ones. 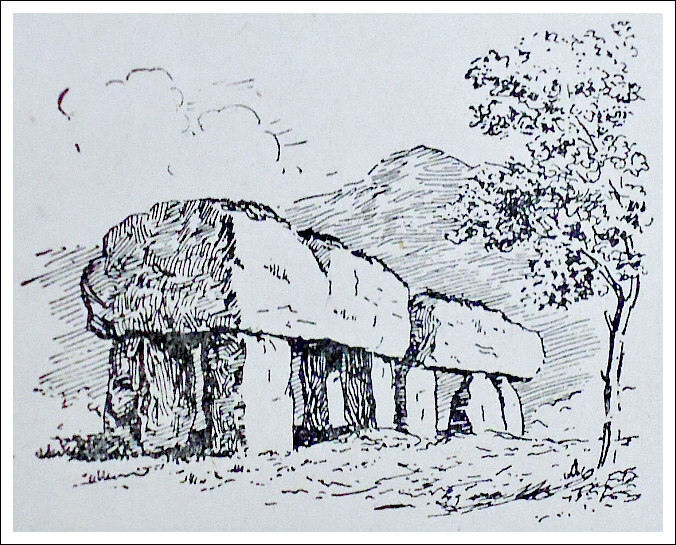 There was apparently an early reference and illustration in ‘Druidical Antiquities’ published by S. Hooper in April 1784, which shows two capstones with the larger one resting on five uprights, according to Chris Barber in his work ‘The Ancient Stones of Wales’. 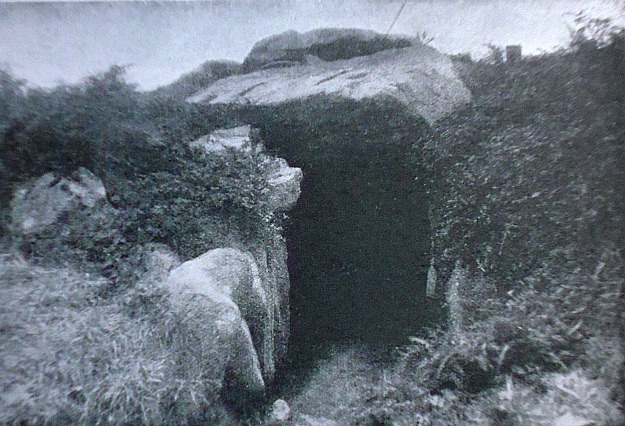 https://commons.wikimedia.org/wiki/File:Bryn-yr-Hen-Bobl_Burial_Chamber,_Plas_Newydd,_Anglesey.jpg This photo is displayed under the terms of the Creative Commons Attribution-Share Alike 4.0 International license. Houlder, Christopher., Wales: An Archaeological Guide, Faber, London, 1978. 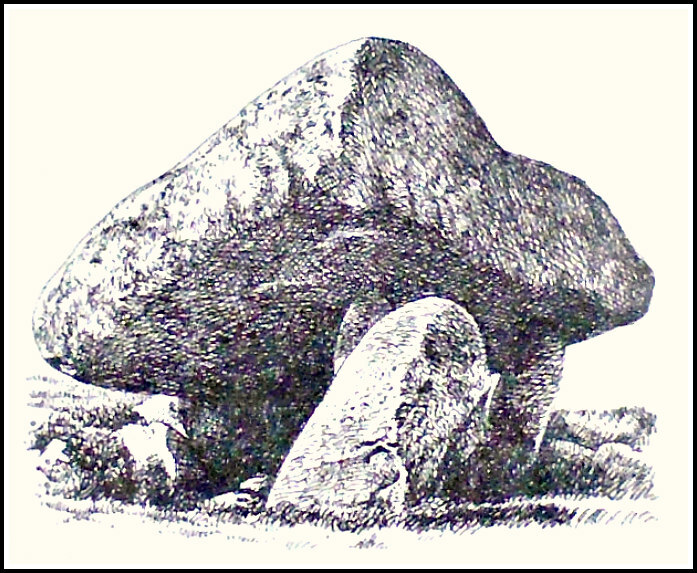 Categories: Burial Chambers, Cromlech, Dolmen | Tags: Plas Newydd Burial Chamber near Llanfair P.G. in Anglesey | Permalink.